The mobile app presents you with a special six-digit code that is used to withdraw the cash. 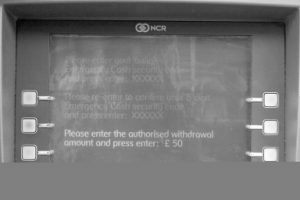 RBS Group this week rolled out a service to all of its customers, allowing them to withdraw cash from an ATM without using their bank card. The service is based upon the same technologies that’s used to provide emergency access to cash by people who’ve had their cards stolen, but integrates directly into the mobile banking apps of the group’s constituent banks. I decided to give it a go. The first step is to use the mobile app to request a withdrawal. There’s an icon for this, but it’s a bit of a mystery that it’s there unless you already know what you’re looking for. You can’t make a request from online banking without using the mobile app, which seems to be an oversight (in case you can’t think of a reason that you’d want to do this, read on: there’s one at the end). I opted to withdraw £50. Next, it’s off to find a cash machine. I struck out, without my wallet, to try to find the nearest Royal Bank of Scotland, NatWest, or Tesco cashpoint. The mobile app features a GPS tool to help you find these, although it didn’t seem to think that my local Tesco cashpoint existed, walking me on to a branch of NatWest. The readout of the cash machine demonstrates that the roots of the “Get Cash” system lie in the older “Emergency Cash” feature: the two are functionally the same thing. As instructed by the app, I pressed the Enter key on the keypad of the cash machine. 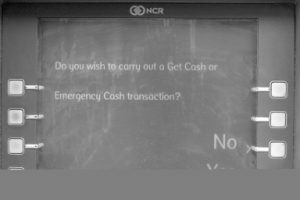 This bypasses the usual “Insert card” prompt and asks, “Do you wish to carry out a Get Cash or Emergency Cash transaction?” I pressed Yes. The number displayed upon the screen is entered into the cash machine. The ATM asked for the PIN I’d been given by the mobile app: a 6-digit code. 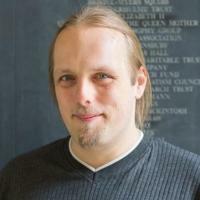 Each code is only valid for a window of 3 hours and can only be used once. 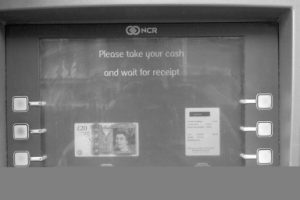 The cash machine asks for the PIN a second time, and then asks for the sum of money to be withdrawn. I’m not sure why, but the ATM asks that the PIN is confirmed by being entered a second time. This doesn’t make a lot of sense to me – if it was mistyped, it’d surely fail anyway (unless I happened to guess another valid code, within its window), and I’d simply be able to try again. And if I were an attacker, trying to guess numbers, then there’s no difficulty in typing the same number twice. It’s possible that this is an attempt at human-tarpitting, but that wouldn’t be the best way to do it. 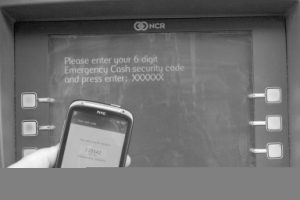 If the aim is to stop a hacker from attempting many codes in quick succession, simply imposing a delay would be far more effective (this is commonplace with cash machines anyway: ever notice that you can’t put a card in right after the last transaction has finished?). Strange. Finally, the ATM asks what value of cash was agreed to be withdrawn. I haven’t tried putting in an incorrect value, but I assume that it would refuse to dispense any cash if the wrong number was entered – this is presumably a final check that you really are who you claim to be. It feels strange taking money and a receipt from a cashpoint without first having to retrieve my card. I spent a few minutes after the experience with a feeling that I’d forgotten something. It worked. I got my money. The mobile app quickly updated to reflect the change to my balance and invalidated the code: the system was a success. If I was suspicious of a possible card-skimming device on a cash machine, but I needed to withdraw money and there wasn’t an un-tampered ATM in the vicinity. It’d be nice to know that you can avoid having your card scanned by some kid with a skimmer just by using your phone to do the authentication rather than a valuable piece of plastic. To send money to somebody else. Using this tool is cheaper than a money order and faster than a bank transfer: it’s an instantaneous way to get small sums of cash directly into the hands of a distant friend. “Sure, I’ll lend you £50: just go to a cash machine and type in this code.” I’m not sure whether or not this is a legitimate use of the service, but I can almost guarantee that it’ll be the most-popular. It’ll probably be reassuring to parents of teenagers, for example, who know that they can help their offspring get a taxi home when they’ve got themselves stranded somewhere. What do you think? If you’re with RBS, NatWest or Tesco, have you tried this new mobile banking feature? Do you think there’s mileage in it as an idea, or is it a solution in need of a problem? The ‘cool and interesting things’ were originally published to a location at which my “friends back home” could read them, during the first few months of my time at the University of Wales, Aberystwyth, which I started in September 1999. It proved to be particularly popular, and so now it is immortalised through the medium of my weblog. Leave a club, and, in a drunken stupor, decide that it’s a sound and logical idea to take £120 out ot a cash machine, because it’ll save you from having to do it later. Realise this tommorow morning, and replace the money. Decide that taking your card out when you’re going to get pissed isn’t such a smart idea, after all.